53 PER (53 Persei). Perseus, the Hero of the Andromeda myth, is so luminous as a constellation that only brighter stars carry proper names and Greek letters. The remainders must do with Flamsteed (or other catalogue) numbers, fifth magnitude (4.85, on the bright side) 53 Persei among them. Even its class B (B4, subgiant) status is reduced as a result of all the other hot stars in the constellation. Part of its dimness is due to interstellar dust that lies along the line of sight. If it were not there, 53 Per would jump to fourth magnitude status (4.34). At a distance of 465 light years, this hot (16,200 Kelvin) star, which radiates much of its light in the ultraviolet, shines with the light of 1100 Suns, from which we derive a radius of 4.2 times solar and a mass 5.7 times solar. The combination shows that 53 is not really a subgiant (which implies that it has just given up core hydrogen fusion), but a more ordinary dwarf about halfway through hydrogen-burning with an age well under 70 million years. The measured minimum equatorial rotation velocity is only 15 kilometers per second, which implies a rotation period of less than 14 days; most likely the star is spinning faster than that with an axis that is more or less pointed at the Earth. Like many stars of its class it is somewhat deficient in metals, having about half the content of the Sun. Why even bother with this star, when there are more glorious ones around it? 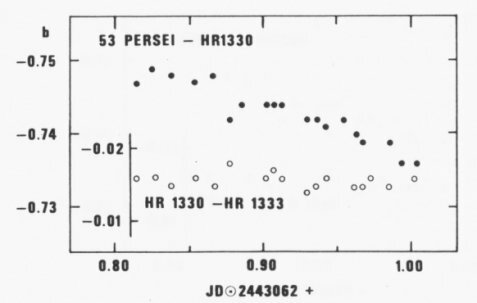 Because 53 Persei is the prototype for a set of rather rare subtle variables called both "Slowly Pulsating B (SPB) Stars" or in fact "53 Per stars." It chatters away with a variation of about two-hundredths of a magnitude (about two percent), far below the eye's ability to perceive. A "non-radial" variable, 53 pulsates with several periods at the same time, some parts of the star moving outward while other parts move inward (the effect also seen through Doppler shifts in the spectrum that show the surface to be oscillating). There are two principal periods, 2.16 and 1.66 days, the two switching in dominance, though four other periods (2.12 days for example) are recognized as well. A more famous version of the set is the set of Beta Cephei stars (or Beta Canis Majoris stars), giants and subgiants that lie at the hot end of class B. The 53 Per stars represent the lower-temperature class B extension into the subgiants and hydrogen-fusing dwarfs. The pulsations are driven by a layer of ionizing metals deep within the star, the layer valving the outflowing stellar heat. Variation, it seems, is almost everywhere if we look for it hard enough. Written by Jim Kaler 12/24/04. Return to STARS.